Home / Posts Tagged "#nogrizhunt"
Within the first few hours of grizzly bear 399’s inaugural 2019 public appearance, photographer Tom Mangelsen caught a glimpse of one of her cubs somersaulting through the snow down a steep hillside. 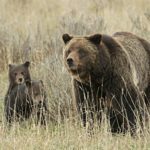 As conservationists await a court date that could stall a proposed Sept. 1 Wyoming grizzly bear hunt, potential shooters last week took a mandatory two-hour grizzly bear ecology class that included instructions on how to make a clean kill. It’s Simple! Shoot ‘Em With A Camera!